Team GAC Pindar skipper Ian Williams ensured the Stena Match Cup Sweden stayed in British hands today as he scored his second consecutive win of the 2011 World Match Racing Tour. 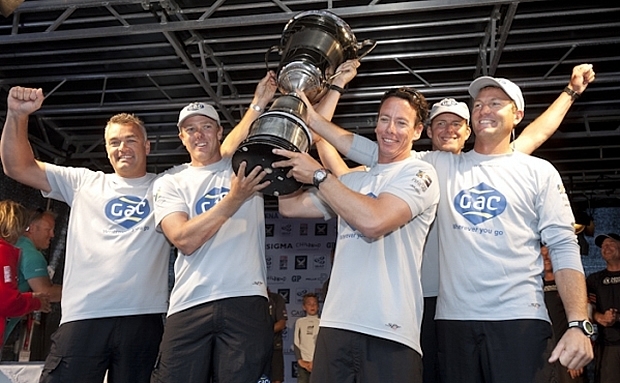 Williams picked up where 2010 event winner Ben Ainslie left off, coming from behind to defeat local hero Swede Bjorn Hansen in a five-match finale. After his victory on the waters of Marstrand Fjord last year Ainslie went on to win the World Championship – and Williams will be aiming to pick up his third world title after closing the gap at the top of the overall Tour standings. The win moves Williams within three points of second-placed Peter Gilmour of Yanmar Racing and within ten points of Tour leader Francesco Bruni. In 2007 Hansen became the first Swede to win Match Cup Sweden – but his dreams of a second title were shattered this afternoon by Williams’ on-fire team. It’s the second time in two events that Hansen has been beaten in the knockout rounds by Williams. Hansen delighted the home crowds with a win in the opening match of the Final, stretching out just enough of a lead on the final sprint to the finish line to take a penalty turn and sneak across the line just metres ahead of Williams. Williams responded, taking total control of the prestart and forcing Hansen over the start line. With Williams charging off to the first mark it looked like bad news for Hansen, but the Swede made great gains up the left side of the course to claw his way back into the match. Hansen attacked, but Williams defended well and was looking good until the last 70 metres of the final run when Hansen picked up a puff of breeze working down the course. Accelerating towards the line it looked like Hansen could steal the win but Williams escaped a last-ditch luff and rolled round Hansen’s bow to claim the victory and equal the scores. The third match saw Williams nail the start with a full boat-length lead over Hansen. Once again Hansen fought back and soon had Williams pinned into the light winds on the far side of Marstrand Fjord. Halfway up the first leg Hansen found himself in front and it was a lead he would defend until the finish line to take the scores to 2-1. The pressure was on Williams to score to stay in contention – and score he did. It was Williams’ textbook start which proved crucial in match four, and Hansen never recovered. With racing poised at two wins each the final – decided by the first team to reach three points – went to sudden death. It seemed the Nordic gods were on Williams’ side as he escaped a penalty call in the prestart and again at mark one. Despite trailing Hansen for the first lap of the decider, Williams all but sealed the victory at the last mark forcing two penalties on to Hansen. With Hansen left with no choice but to take an immediate penalty turn his dreams of a second Stena Match Cup Sweden title were fading fast. Hansen could do little as Williams passed him and sailed the final leg to victory. Dane Jesper Radich of Adrian Lee & Partners secured third place, his best result of the 2011 season, with a 2-1 victory over Peter Gilmour in the Petit Final. After an opening win for Gilmour, Radich levelled the scoring in match two. Gilmour’s bid for third took another blow as he was then docked one point for a collision earlier in the match. With just one more win needed to secure the final podium position, Radich led off the start line and never looked back, winning by a huge margin. With five stages of the 2011 World Match Racing Tour complete and three more remaining, just 28 points separate first and eighth, while six points separate fourth and eighth place on the leaderboard. The next stage of the Tour will see racing head to St Moritz in Switzerland from 30 August to 4 September where the skippers will vie for the title of King of the Mountain.